Skiing Uphill – It’s a Thing. And Here’s Why You Should Try It. 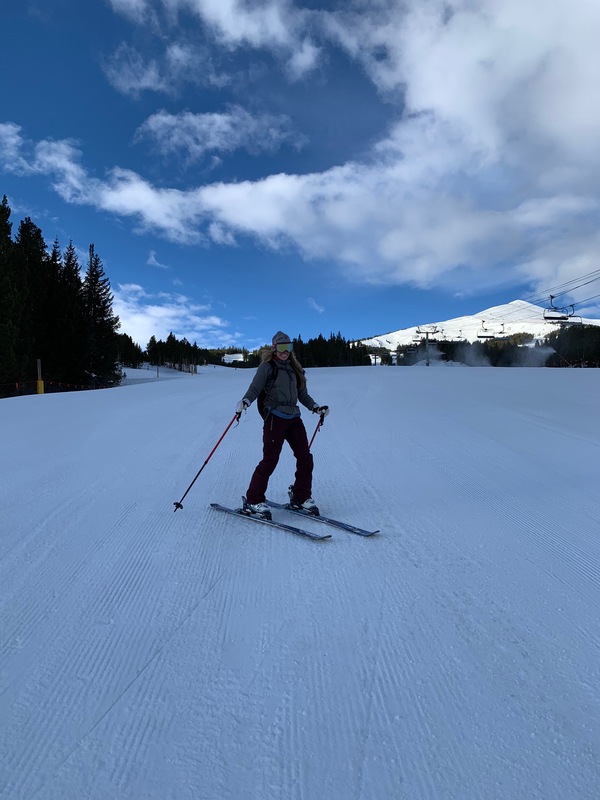 I’ll never forget when I first heard about this “uphill skiing” concept and I thought, “Don’t they know they’ve invented chairlifts?” I never thought I would try it, let alone love it, and basically be addicted to it. Why do I like to ski uphill? The feeling of crisp, fresh air on my face as the sun rises and I begin my trek up the slopes. The overwhelming gratitude I am filled with to have such a beautiful experience in nature. The feeling of accomplishment for summiting a mountain as the sun rises. The overflowing amount of joy and happiness that I feel from head to toe for the rest of my day. The serene and peaceful turns on untouched snow. These are the reasons I have fallen in love with skiing uphill – I suggest you try it and see for yourself! Register online for uphill access parking. Read these guidelines for uphill access at Breckenridge Ski Resort. Call the Breckenridge Ski Resort Cat hotline the morning before heading up hill 970-547-5627. Invite a friend – the backcountry is always better with company and it is recommended for safety too. So, what is “Skinning”? “Skinning” is the affectionate nick name given to uphill skiing because the mechanism that is placed on the bottom of your skis in order to provide traction used to literally be made of animal skin. Today (rest assured) they are not made from real animal skin, yet the nick name remains. The more formal names for this sport include: “Randonee” skiing, Alpine Trekking, AT or even split-boarding. As long as you are using one’s own power, paired with specialized equipment and “skins” to get up the hill, you can consider yourself “skinning”. I only have one last warning: try this sport at your own risk, the gear can be quite expensive and there is a strong chance that after you try it once you will be hooked and have to purchase your own gear. The good news is, you won’t regret it. Disclaimer: I am not associated with Breckenridge Ski Resort. Please refer to their uphill access guidelines and always pay attention to snow reports to remain safe in the backcountry. https://www.bestofbreck.com/wp-content/uploads/2018/12/blog_1.jpg 1500 1500 Meckenzie Donnell https://www.bestofbreck.com/wp-content/uploads/2015/08/logo-332x156.png Meckenzie Donnell2018-12-18 17:06:352019-01-23 08:22:26Skiing Uphill – It’s a Thing. And Here’s Why You Should Try It.